47% of Americans can't go more than 24 hours without their smartphone, according to BankAmerica research. How would your life change if you had to go an unplanned 48 hours without Internet access? Consumers are going digital. The World Wide Web set that in motion years ago, and now the transformation is accelerating faster than the Millennium Falcon. As the masses adopted smartphones, digital expanded beyond the desktop and spread everywhere. Digital permeates our lives. This isn't about technology adoption anymore. Digital transformation has literally changed consumer behavior. They live their lives differently, and the expect to engage differently. Consumers used to prefer getting assistance from a human as soon as possible. Digital consumers expect to take matters into their own hands, usually with a touchscreen or a mouse. They prefer self-service, but if necessary, they expect to reach a human as easily as they can search the web. Consumers used to think in terms of sticking with a task from start to finish. Digital consumers are always multi-tasking. They live their lives in micro-moments, and it's natural for them to take small steps forward whenever they have time. The best way to engage is to meet them in the moment. Consumers used to avoid interruptions when engaging with you, because they didn't want to have to start over and repeat themselves. 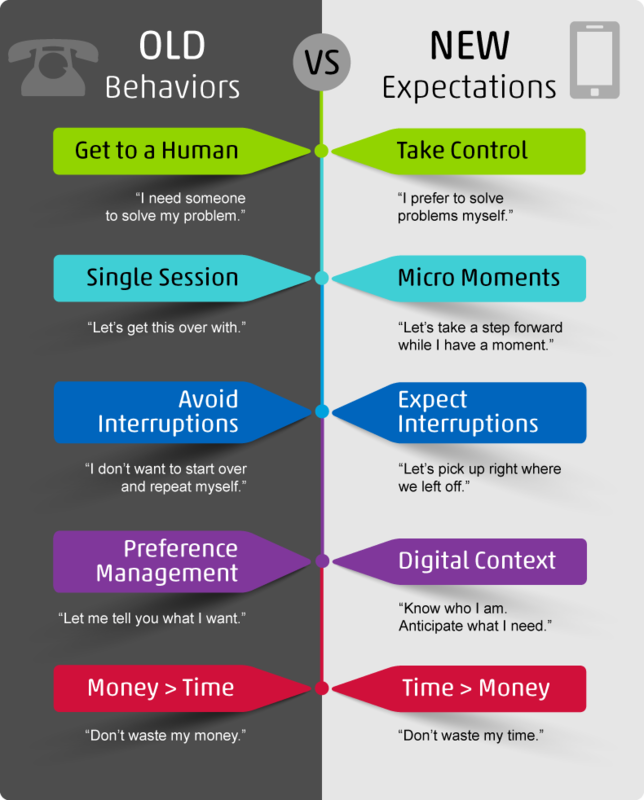 Digital consumers expect interruptions. Their lives are full of interruptions, and they don't want to make exceptions when engaging with you. They expect you to accomodate their interruptions, and then pick up right where they left off. Consumers used to want you to know their preferences, and engage with them on those terms. That's no longer good enough. Digital consumers expect you understand context and anticipate their needs. Consumers used to crave discounts. Money was the most valuable currency. Digital consumers value their time more than their money. They're so distracted by tasks and people competing for their attention, the most valuable thing you can do for them is to respect their time.